Azealia Banks is back in the headlines for yet another social media beef, following her feud with Cardi B. This time, she's gunning for Teyana Taylor. Why? Well, here's how it all started. The "212" rapper uploaded a behind-the-scenes clip of her busting out new choreography for her new "Anna Wintour" video on Instagram. 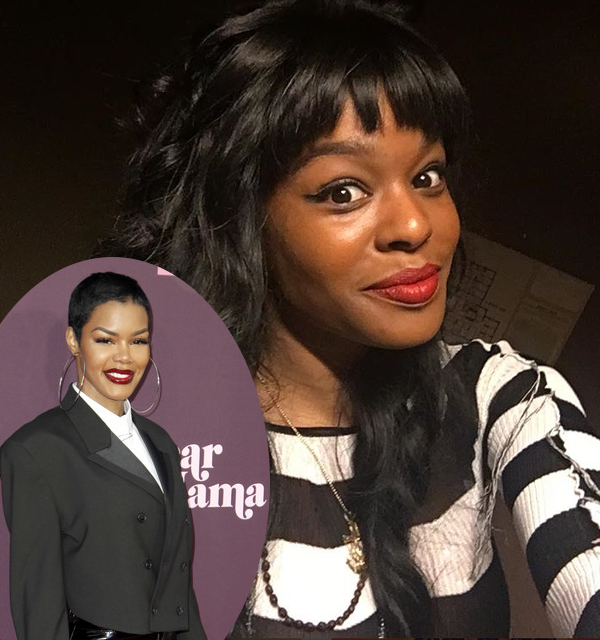 A fan wrote in the comments section that Azealia's dance moves reminds her of something Teyana already did and that's when Azealia accused Teyana of STEALING choreography for Kanye West's "FADE" video from choreographer Matthew Pasterisa, who she's currently working with. ANNA WINTOUR BTS choreo by : Matthew Pasterisa and Azealia Banks. 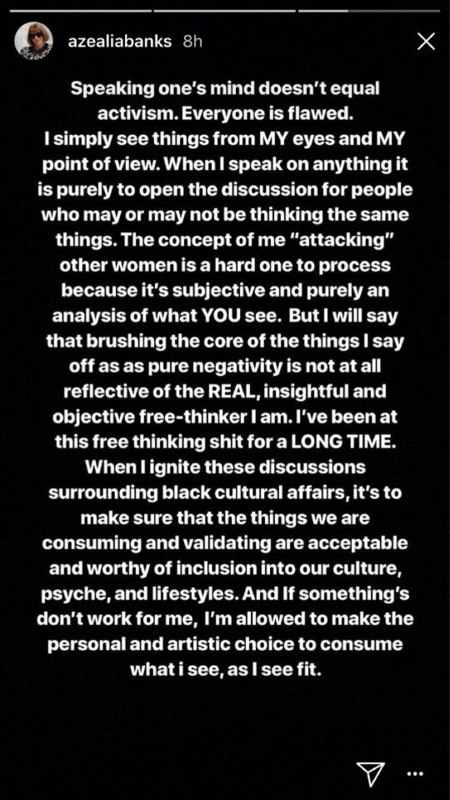 Teyana Taylor caught wind of Azealia's shade and clapped back in an Instagram video. And she made sure everyone knew exactly who she was responding to by "@'n" Azealia and Matt. She captioned, "@azealiabanks So I was too busy enjoying my Mother’s Day yesterday! But today is a new day! Junie is taking a nap so mama got ah lil bit of time TAHDAY!!!! WASSUP!!!! @bornready_matt give ya friend some clarity with all her inaccurate information, so she can stop spewing out all of this false information." @azealiabanks So I was too busy enjoying my Mother’s Day yesterday! But today is a new day! Junie is taking a nap so mama got ah lil bit of time TAHDAY!!!! WASSUP!!!! @bornready_matt give ya friend some clarity with all her inaccurate information, so she can stop spewing out all of this false information. The VII singer then posted up more receipts explaining to Matthew why he wasn't paid (she wasn't paid either) for "FADE" and threatened to release MORE receipts. Also, she explained how "very small portion" of choreography they originally created for Beyonce's "End of Time" did end up in the "FADE" video, but she made sure to give him credit for it. 2011 (video uploaded to YouTube a year later once we knew for sure it was not being used by bey) Why didn’t you respond directly to me Matt?? @bornready_matt First off, FADE was something that was VERY spontaneous! Anyone that knows how Kanye is, knows that spontaneous is his get down. Newsflash! I did “Dark Fantasy” 3 hrs before he had to turn in MBDTF, and guess what??? I was NEVER credited!!! That’s the difference, you were! But it was nonetheless still a good look & a Blessing for me, in which I recognized that, and didn’t feel so called “stolen from”. NOONE knew he was going to even put the video out! Therefore NOONE got paid!!! Not even Me!!! It was an amazing look for EVERYONE involved INCLUDING YOU!!! In which you prematurely jumped in your feelings thinking that you weren’t credited. Do I need to post screenshots of your apologies saying that you jumped to conclusions?? Do we need to open up that can of worms?? Do we need to post the screenshots of the convo between my mom/manager and your manager just yesterday?? This could have all been avoided if you would have checked your friend from the gate. And for the record, only a very small portion of our choreo that WE created that was used to present to Beyonce for “End Of Time”, but was never used because she got pregnant with Blu was even used. I was actually extending you a look, but you were being too narrow minded to even see your Blessing! WE’VE BEEN CREATING WHAT YOU CALL “our legacy” since 2005!!! Never forget! P.S. funny how you posted a video of you teaching a dance class doing this choreo, but if my memory serves me correctly, isn’t this the same time I submitted OUR video to @tytryone for consideration for Bey? IT WAS NEVER A SECRET THIS PORTION OF THE CHOREO WAS OLD AND WAS ORIGINALLY CREATED FOR BEYONCE! IVE SAID THAT IN EVERY INTERVIEW! And GO BACK AND READ YA OWN INTERVIEWS OF U ADMITTING WE CREATED THE CHOREO TOGETHER. U WANTED CLOUT HERE U GO! Enjoy! And you was just smiling in my face at the @juniebeenails salon opening! Lol a couple of months ago. Basically, Teyana wanted Matthew to check his friend for spreading false information. Hmm...does she have a point here?